악기케이스 내부에 장착하여 습도를 유지시켜주는 제품입니다. 별도의 제습제나 에어콘, 통풍이 잘되는 장소에 악기를 보관하시기 바랍니다. For use IN-THE-CASE of any wooden instrument! Although originally developed for fretted stringed instruments, it has proven to be invaluable for the case humidification of all delicate wood instruments; players of everything from violins and violas to oboe, flute, clarinet and zither have all come to rely upon it for maintaining safe humidity levels for their instruments! For many players of fine instruments, the winter is always a time of worry. Delicate--and not so delicate--musical instruments are very susceptible to the extremes in ambient humidity brought about by the use of central heating systems! Players who live in very dry climates are also liable to the same concerns! Low humidity can be very dangerous to instruments! Many solutions have been offered to effect some protection--all of them effective to a limited degree. The most popular "snake" humidifier [such as the John Pearse® Humidifiers for Guitar or Mandolin below] may humidify the body cavity of an instrument, when it is not in use, but may not protect the neck and fingerboard from shrinkage. To provide adequate protection, the entire instrument case must be turned into a safe environment! The K-Saire System does just that! It consists of a high-quality precision hygrometer with gradations every 2 percent--which is mounted inside the case in an easily read location--and an efficient humidifier which is mounted in the headstock area of the case. This allows moisture to be diffused throughout the case ensuring a maximum humidification of the entire case! The K-Saire™ System is very easy to use. The humidifier is charged with either distilled water or the special K-Saire™ fluid allowing a steady release of moisture over an extended period of time. 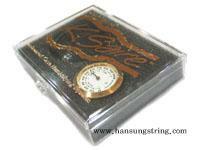 Everytime the case is opened, the hygrometer [in plain sight] displays the humidity level within the case. IF the level should fall below 40%, you recharge the humidifier in order to return the humidity to a safe level.